At a time when the online landscape is dominated by those who shout the loudest, the voices of climate experts like Vincent’s are at risk of being drowned out. 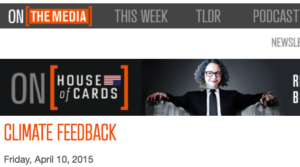 At Climate Feedback, scientists encourage better science reporting. 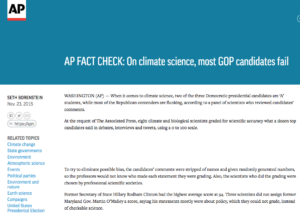 Climate scientists have volunteered by the dozens to review the accuracy of stories about climate change. 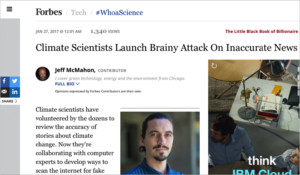 Now they’re collaborating with computer experts to develop ways to scan the internet for fake and misleading stories about climate. 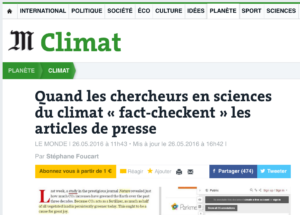 “The concept is to try to bring the scientists to have a voice of their own in this media environment, and the way we are doing it so far is by asking scientists to review articles for accuracy and credibility of information,” Emmanuel Vincent, founder of climatefeedback.org, said Thursday in Chicago. […] He told an overflowing crowd at the University of Chicago’s Computation Institute Thursday that his website’s purpose goes beyond fact checking, because there are other forms of misleading information, such as cherry-picked half truths, biased information, rhetorical manipulation, and ill-defined terms. 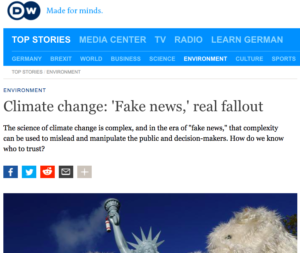 Can you trust what you read about climate change? In a world where the answer to a yes or no question like “Was it hotter last year than ever before?” is up for debate, how can you know what to believe? 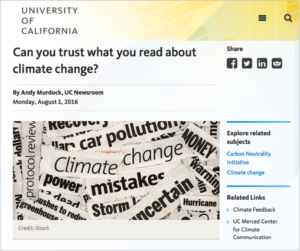 Emmanuel Vincent and colleagues at the Center for Climate Communication at UC Merced had an idea: What if scientists could review online articles about climate change for accuracy? 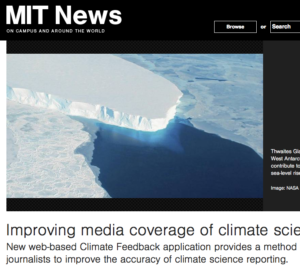 Their online project, Climate Feedback, has made this a reality, powered by a growing group of Ph.D.s from around the world who volunteer their time to review articles on climate change in the mainstream media. There are currently over 100 scientists in the ranks at Climate Feedback, hailing from institutions all over the globe, with expertise in climate science and related topics including public health, food security, forestry and marine biology. « Personne ne le dit jamais, mais dans bien des cas, le réchauffement climatique sera une bonne chose. » C’était le titre d’une tribune du célèbre climato-sceptique Bjorn Lomborg, publiée le 5 mai par The Telegraph. Hélas pour le quotidien britannique et le statisticien danois, quatorze chercheurs en sciences du climat se sont penchés sur l’argumentaire développé dans le texte : à peu près toutes les chevilles du raisonnement contreviennent à l’état des connaissances. Ce « raid scientifique » sur le texte de Bjorn Lomborg, désormais affublé de surlignages et d’âpres commentaires, n’est pas le fruit du hasard ou d’une action isolée. Il est le résultat d’une initiative académique, Climate Feedback, lancée par l’université de Californie à Merced. 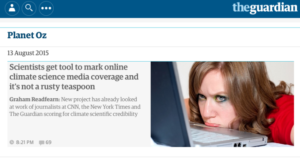 One growing community of scientists has a new tool at their disposal to assess the credibility of climate change stories and commentary online. And it’s not a rusty teaspoon. 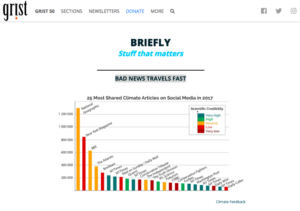 Using the Climate Feedback tool, scientists have started to diligently add detailed annotations to online content and have those notes appear alongside the story as it originally appeared. As a climate scientist, one of my personal motivations is the frustration I have when I read some news on climate that I know are inconsistent with science and I have no efficient way of sharing this knowledge. 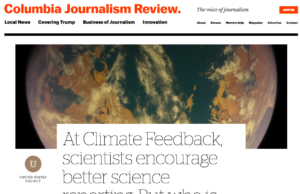 I wanted to develop an effective and scalable way for scientists to share what they know with readers and journalists. Also, many of my friends or colleagues –who do not have expertise in climate– are often genuinely confused by contradictory stories on climate change, for instance when one outlet says polar ice is melting and another says it isn’t. If my friends are confused, I’m sure there are plenty of others who could benefit from a thorough analysis by those knowledgeable on the topic. In the arena of climate change coverage, there is often a gap between science-based facts and what is actually reported. 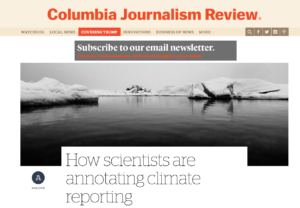 In efforts to remedy this, Climate Feedback is a collective of accredited scientists using a browser plugin to annotate climate change news. 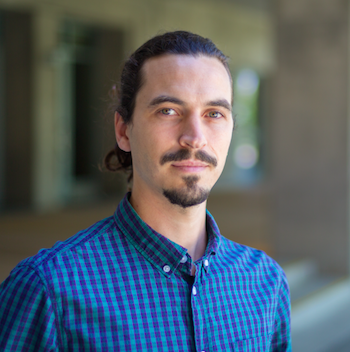 Bob speaks with the project’s founder and researcher at the University of California Merced’s Center for Climate Communication, Emmanuel Vincent. It’s an appropriate name for a group that’s attempting to slow some of the runaway misinformation about climate change, by doing what scientists do with their published work: review it. 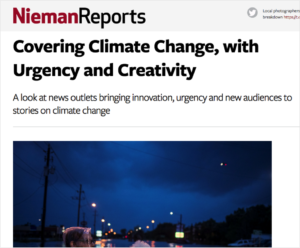 To improve the situation, Vincent channeled his frustration into launching Climate Feedback, a method that aims to help journalists, science writers, and scientists who write for the public, to assess the quality of their reporting on climate science and find better sources of information. 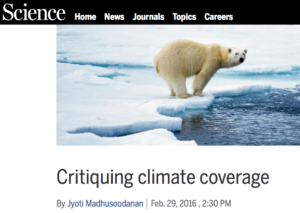 It also allows the general public to investigate the accuracy of climate stories.